Monsters Ate My Condo is the craziest puzzle game we've played. It's so off the wall that it makes the original Tetris seem like an old lady trudging across the street while hordes of angry drivers honk to get the wrinkled bird to pick up the pace. Here, the goal is to keep a tower of condos from tipping over by matching three or more of the same color to score huge points. 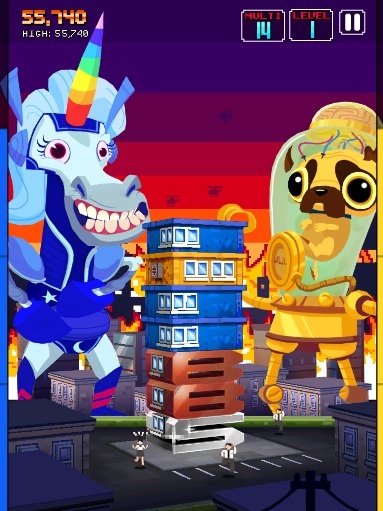 To throw a proverbial monkey wrench into things, the developers at PikPok added four huge monsters, two of which stand on either side of the tower at all times. Feeding them condos of their own corresponding color makes them happy, while doing the exact opposite sends the beasts into a rage; shove too many into their mouths and they'll attack the tower. On top of that, swiping flashing blocks in their direction activates their special powers that do a host of things, from doubling points to automatically straightening the tower. It's a bizarre but immensely satisfying experience, thanks in part to the addictive premise, excessively colorful graphics, NES style music and online leaderboards. Besides, how can you hate on a game starring an oversized unicorn and crab with a cruise ship attached to its head? Impossible, we say. What's Hot: Sensory overload, cool monsters, addictive play, leaderboards, retro graphics and music, one fat lady.